PORT-AU-PRINCE, Dec 20 2011 (IPS) - Ever since being elected earlier this year, Haitian President Michel Martelly and his team have been betting Haiti’s reconstruction on foreign investors. “We are ready for new ideas and new businesses, and are creating the conditions necessary for Haiti to become a natural and attractive destination for foreign investment,” the new president said at a meeting in New York City last fall. The new government’s showcase project is the Caracol Industrial Park, being built with 124 million dollars of U.S. taxpayer funds, and another 55 million dollars from the Inter-American Development Bank. While the president might be new, and there might be new actors on the scene, there’s not much new about the plans. 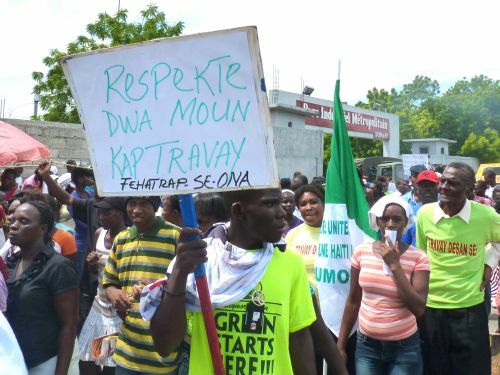 A recent report from the Haitian investigative journalism partnership, Haiti Grassroots Watch, shows that the focus on assembly industries is not such a “new” idea. • Over one-half the average daily wage is used up to pay for lunch and transportation costs to and from work. • Haiti and its neighbours have all tried the "sweatshop-led" development model – and it has mostly not delivered on its promises. • At least six Free Trade Zones or other industrial parks are in the works for Haiti. • The new industrial park for the north does not come without costs and risks: Massive population influx, pressure on the water table, loss of agricultural land, and it's being built steps from an area formerly slated to become a "marine protected area." Ever since Nelson Rockefeller visited dictator François “Papa Doc” Duvalier, Washington has been pushing Haiti to offer up its “comparative advantage” of rock-bottom wages. Papa Doc vowed to create the “Taiwan of the Caribbean” and his heir, Jean-Claude “Baby Doc” Duvalier, said he would carry out an “economic revolution”. In the early 1980s some 80,000 people were stitching baseballs and piecing together electronics for mostly U.S. companies. The sector atrophied after the dictatorship. Many foreign companies picked up and left as popular unrest increased. But the national industrial park SONAPI stayed open and the governments that followed have continued to court foreign investors, counting on the needs of multinationals to guide the country’s economic development. Today, about 29,000 people work in the hangar-like factories, but the Martelly government has said it wants to “create” 200,000 or even 500,000 assembly industry jobs. Nevertheless, Haitian governments have continued to bet on assembly industries. In 2002, then-President Jean-Bertrand Aristide government signed into law legislation granting foreign investors 15-year tax holidays and other benefits. In 2003, Aristide himself traveled up to northeast Haiti to break ground for the CODEVI free trade zone. Chalmers, who heads the Haitian Platform for Alternative Development, deplores what he calls incredible “short-sightedness” and lack of vision. The first company to sign up for the new Caracol Industrial Park was South Korean textile giant Sae-A which, according to media reports, produces 1.4 million pieces of clothing a day in its 20 factories. Sae-A ships to K-Mart, Wal-Mart, GAP and other major U.S. clothing chains and has promised to invest 78 million dollars. “Investors still do not believe or understand the value and potential of Haiti as we do,” Kim Woong-ki, chairman of Sae-A, told the Associated Press after a ceremony inaugurating construction at the Caracol park last month. For Sae-A and for the Dominican companies stitching clothes in Haiti, the potential is as clear as day. Post-earthquake U.S. legislation called “HELP” (Haitian Economic Lift Program”) allows Haiti-based companies to ship clothing duty-free into the U.S. until 2020. And what remains unspoken – both in Haitian and foreign coverage – is the fact that the U.S. taxpayer-subsidised factories in Haiti likely result in lay-offs for workers in countries with higher wages, including the U.S., which has lost over 700,000 textile and apparel jobs since 2000. The area chosen for the country’s new 243-hectare Caracol Industrial Park is near the coast, halfway between the northern cities of Cap- Haitien and Ounaminthe. It was recommended by a U.S.-based consulting firm hired by the Ministry of Economy and Finances (MEF), Koios Associates. Koios’s September 2010 study said the site was ideal, in part because the land was “devoid of habitation and intensive cultivation”. Except it wasn’t quite “devoid”. The Caracol site was home to 300 farming plots. But last January, without notice, contractors put fences around 243 hectares, mostly lands that had been leased by peasant families from the state for decades. Most of the farmers have been paid for their lost crops, and many have been offered replacement land, but in less fertile areas. Putting an industrial park – which will attract between 20,000 and 200,000 new residents – in the midst of a fertile area is not necessarily going to contribute to Haiti’s “sustainable development”, despite government claims to the contrary, economist Chalmers notes. Haiti has gone from virtual food self-sufficiency three decades ago to importing over 60 percent of its food. Taking more land out of production will only increase that figure. Despite being slated to be home to Haiti’s first modern textile mill – which will be using toxic dyes – the Caracol park is being built only about five kilometres from the Caracol Bay, home to some of the country’s last mangrove forests and coral reefs. But – by its own admission – the Koios firm didn’t consider any of these factors, nor did it consult with the Ministry of the Environment. Koios also claimed it was not aware of the “the complex and precious ecosystem of the Caracol Bay” when it recommended the industrial park site, despite the fact that there are numerous public documents on plans to turn the bay into a marine park. Koios also recommended that – due to the “new” information – perhaps the government ought to consider moving the site. Not surprisingly, the study was never discussed by the media. The industrial park site was not moved. And, despite repeated requests, neither the Ministry of Environment nor the Ministry of Economy would speak to HGW about these documents, the Koios recommendations, or the choice of Caracol. HAITI: Behind the Closed Doors of Port-au-Prince "Reconstruction"
Since then, even though most of the documents are available to the public, no major media outlet has discussed them or the considerable environmental risks related to the bay, the water table, the inevitable population boom and associated water and sanitation challenges. *This story is the second of a two-part series on the pitfalls, disadvantages and risks of a major new industrial park and the Martelly government’s focus on luring foreign investors to Haiti. It was adapted from a longer investigative series by Haiti Grassroots Watch (HGW). HGW is a partnership of AlterPresse, the Society of the Animation of Social Communication (SAKS), the Network of Women Community Radio Broadcasters (REFRAKA), the Journalism Laboratory at the State University of Haiti, and community radio stations from the Association of Haitian Community Media.